Buy a pillow. Give a dream. One of my favorite things to do on Instagram is mindlessly scroll and get lost in the links and users. It's one of the easiest ways to discover new brands and fashion forward people! "THROW is a social call to action. For dreamers to rise above the bad and use their God given talents and dream to do more than just simply live, but to live on purpose. To leave a positive impact on this world, to make their life one to remember. THROW empowers dreamers of all ages to believe in their dreams, no matter their circumstance. THROW will use a percent of its profits to create the funding needed to provide beds to children in need not only in the United States, but all over the world." This spoke volumes to me. Not only because of the power of dreams but because of the giving that's behind it. They're helping sweet little children get a bed of their own. How many times a day do you mumble "ugh I just want to be home in bed"? Just let that sink in… Yep, now you're thinking about it as hard as I did when I found their site. THROW stands for Together Helping Reach Our World. With every purchase, you are helping provide a warm bed to a kid that may otherwise be sleeping on the floor. I've recently been feeling like I'm not doing enough with my blog. I let negative attitudes get to me really easily and I constantly feel like I'm not good enough. Should I let others opinions get me down? Do I look pretty/trendy/cool enough to post this outfit? Will people like me? Do I sound silly? This week has been tough in particular (it's only Wednesday, I know…) so this post is coming as a perfect reminder. Coming home and seeing my perfect little pillow makes me lift my chin a little higher. 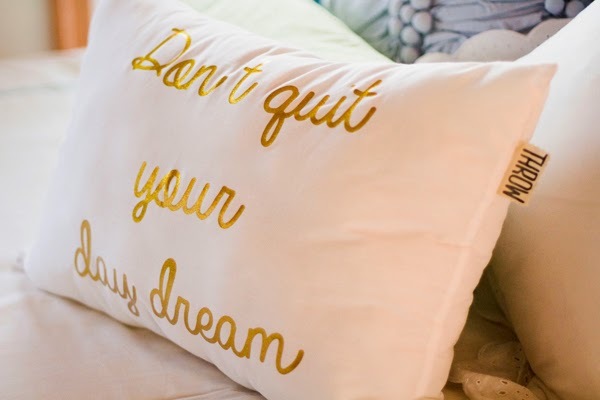 I've always loved the phrase "don't quit your day dream." I consider myself a fighter because I've worked incredibly hard to get where I am job-wise and blog-wise. Losing faith in yourself is the first step in losing sight of your dreams. I realized a good place to start would be with my readers… but I wanted to do more than just a giveaway for y'all… I wanted that giveaway to have an impact. A meaning. A reason! Enter the Rafflecopter below to find out how you can win! Winner will be announced this Friday night at midnight so hurry!! Even if you don't win - this would make a pretty adorable Mother's Day gift don't you think?? Beds4Kids is an organiatization that provides beds and bedding accessories for children and teens who do not have the privilege of having a bed to sleep in. Every day they work to change lives, one night's sleep at a time. They believe that the future starts within dreams, and they want to give these children the opportunity to dream big. $250 provides a complete bed for a child. However, any donation helps! 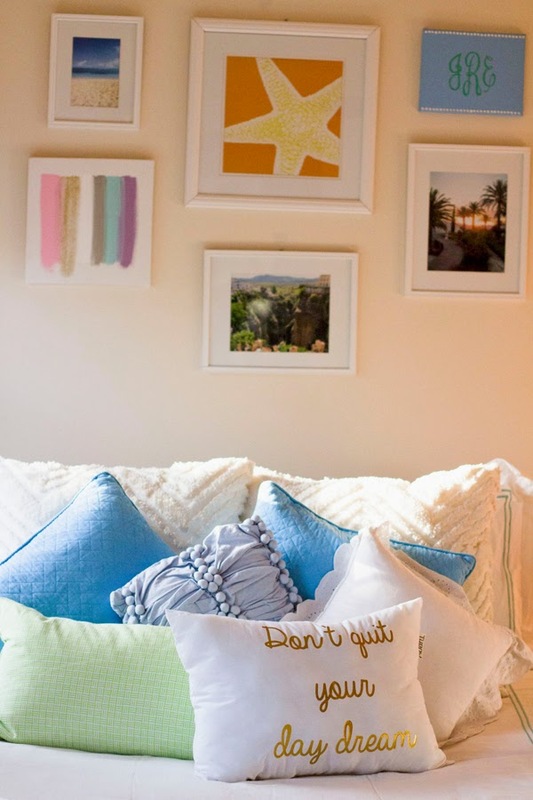 these are adorable- would be the PERFECT addition to my college apartment!! All my friends would want one after seeing them! That's exactly how I felt after scrolling through the designs! Love this post, Jenn! I completely agree about sometimes not feeling like I am doing enough with my blog or let myself compare my journey to other's too much. 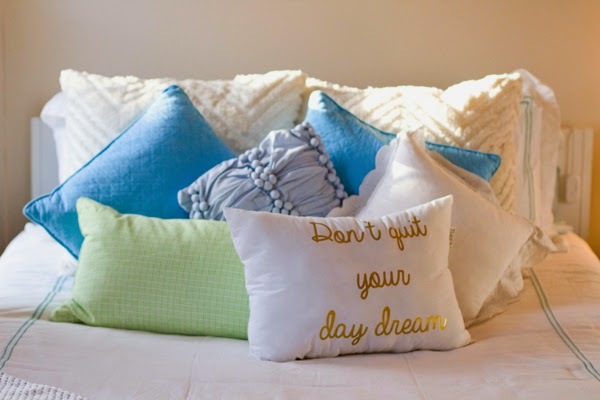 Don't quit your day dream is a great reminder -- definitely don't quit yours! You're killin' it! Thanks so much, lady!! It's a tough feeling... there's no easy way around it! xoxo! "dress like you're already famous" is such a great one too!! This is a great post! I too have been feeling a little negative lately and am always worrying about what people think of me when I post a blog post or something on Instgram. I love the one about writing your life story in colored pencils, although don't quit your day dream is a good one too! It's a tough place to share on because the internet is full or people hiding behind a screen. I've recently been really concerned with what my friends think of me blogging... at the end of the day i have to remind myself that I'm doing this for myself and to inspire other people. Not just to have my friends think I'm "cool"! Thanks for reading... keep your chin up too, love! I love "don't quit your day dream"! Thank you!! Couldn't resist getting my own personalized pillow ;) good luck!! Such a great foundation to build a company on! 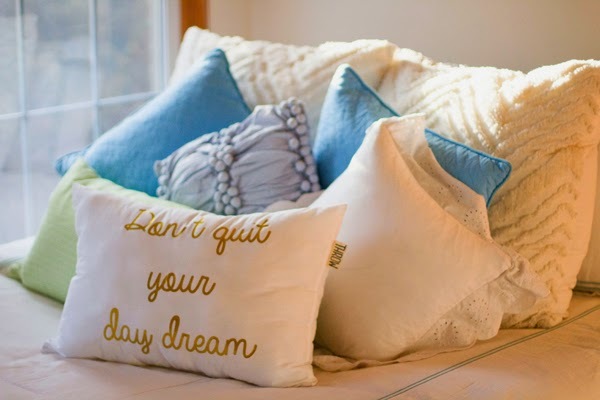 I love the gold print on the pillow and the "don't quit your day dream" is just too good! Isn't it?! She's doing something creative and passionate while giving back. Seriously good combo!